Disposal of canine waste -- See Ch. 178, Art. III. ALTERNATE DAY PICK-UP -- Any day other than the scheduled pick up day for each property. BULKY ITEMS -- Any item that does not fit within a City Refuse Bag. Bulky items include, but are not limited to: refrigerators, stoves, microwaves, freezers, washers and dryers, air conditioners, sinks, tubs, toilets, furniture, swing sets, lawn furniture, rugs, and lawn mowers. CITY REFUSE BAG -- A plastic bag of such size and design as shall be determined by the Commissioner of Public Works, containing a distinctive label, to be used for the collection and disposal of solid waste in the City of Binghamton. (1) Every waste accumulation of animal, vegetable, fruit or similar organic matter that attends the preparation, use, dealing in or storage of meat, fish, fowl, fruit or vegetable; metal containers, paper cartons or other containers that have contained food materials and beverages; discarded paper, rubber (excluding tires), cloth, leather, sweepings, as well as inorganic waste such as glass, porcelain or other similar waste materials that ordinarily accumulate around a home, business or industry. Garbage shall not, however, include those items designated by ordinance, rule or regulations as recyclables. (2) Further exclusions. Prohibited materials include flammable or explosive substances, paint, paint thinners or solvents, pesticides, acids, caustics, or similar wastes, oil, tires, batteries, garbage or trash generated outside the City of Binghamton and medical waste. LITTER -- Any quantity of uncontainerized paper, metal, plastic, glass or miscellaneous solid waste which may be classified as trash, debris, garbage or junk. METAL GOODS -- Large household appliances. RESPONSIBLE PERSON -- In all cases, the property owner; additionally, when readily identifiable, shall also mean the tenant whose solid waste is at issue. SOLID WASTE -- All material described as garbage, yard waste and trash as defined in this chapter. TRASH -- Discarded household furniture, bedding and mattresses, and other bulky household materials not specifically prohibited by this chapter, too large to place in standard refuse containers, except those items designated by ordinance, rule or regulation as recyclables. Trash shall not include concrete, cinder, block, stone or other masonry materials. YARD WASTE -- Grass clippings, garden materials, leaves and brush trimmings. § 350-2. Household solid waste containerization. All residences located in any area in which collection is by the City or private contractors shall have sufficient container capacity to accommodate their normal volume of solid waste between collections. In cases where this requirement may result in an unreasonable number of containers, the Commissioner of Public Works may require an alternate method of storage. However, the base standard shall be up to two cans per unit within any residential dwelling. § 350-3. Construction, capacity and placement of garbage containers. All garbage shall first be placed in City refuse bags. Such City refuse bags shall then be placed in a watertight and weatherproof container of galvanized metal, unbreakable plastic or other substantial material which can withstand the cold without becoming brittle and which can stand up to normal use. A. Such exterior containers shall not exceed 32 gallons in capacity nor shall they weigh more than 60 pounds full. B. Such exterior containers shall be equipped with tightfitting covers, shall be covered at all times, and shall have two substantial handles for each dumping. C. All exterior garbage containers placed out to the curb for collection shall be imprinted with the house number of the property for which the container is provided. § 350-4. Dirty and defective containers prohibited. Garbage shall not be placed in containers which are in a filthy, leaky or defective condition. Any container which does not conform to the prescribed standards or which has defects likely to hamper collection shall be replaced promptly by the owner or user of the container. Failure to do so within four days after notification shall constitute a violation of this section. § 350-5. Garbage to be drained and wrapped for disposal. All garbage shall be thoroughly drained of its moisture before being deposited in a City refuse bag. § 350-6. Preparation of trash for collection. Trash shall be placed in suitable containers, approved by the Commissioner of Public Works. If a container is not practical, trash shall be so securely sacked or tied in bundles as to prevent blowing and scattering and be easily handled by one person. The Commissioner of Public Works reserves the right to establish limits on the amount of trash which may be placed for collection by the City. However, the maximum permitted pursuant to this article shall be a total of 500 pounds properly bundled as follows: No bundle shall exceed four feet in length or weigh more than 60 pounds. § 350-7. Placement of containers for collection generally. Receptacles containing garbage shall be placed at the curbline in front of the premises where such garbage originated. If such location is inconvenient or inaccessible for collectors, the Commissioner of Public Works may require the responsible owner or occupant to place such containers at some convenient and accessible location. § 350-8. Placement of solid waste for collection. Solid waste shall be placed between the curb and the sidewalk in front of the premises where such waste originated on the night before the regular day for collection of such refuse, as specified by the Commissioner of Public Works. § 350-9. Placement of garbage for collection; removal of empty containers. A. Garbage designated for disposal shall be placed at the curbline not earlier than the evening preceding the normal garbage collection day, but not later than 6:00 a.m. on the day of scheduled collection. B. After collection, all empty garbage containers must be removed from the curb as soon as possible, but not later than 11:00 p.m. of the same collection day, and placed in a garbage port or at the rear of the building so that such containers shall be reasonably out of view from the street. C. Containers remaining at the curb on the day after collection may be picked up and disposed of by the City. § 350-10. Solid waste containerization and collection for commercial and industrial establishments. All commercial and industrial establishments which generate solid waste for collection by the City shall abide by the container and collection requirements as prescribed in this article or as directed by the Commissioner of Public Works. The Commissioner of Public Works shall have the authority to refuse the collection of commercial or industrial solid waste which in his or her opinion is deemed excessive in quantity and extraordinary in substance. The base standard pursuant to this section shall be six cans per establishment. § 350-11. Removal of solid waste at construction/demolition projects. It shall be the responsibility of the builder, contractor and property owner to collect, remove and dispose in a legal manner of building waste resulting directly from building, construction, reconstruction, repair or grading. Builders, contractors and property owners are required to provide on-the-spot containers to keep waste materials from accumulating on and spreading from construction/demolition projects. § 350-12. Excessive accumulation of solid waste. Any accumulation of solid waste and any waste building materials in excess of ordinary accumulation associated with the land use thereof, resulting from the failure of any person or property owner to comply with any provision of this article or the rules and regulations of the Department of Public Works, or from their failure to take advantage of the regular collection service, shall be removed by such person or property owner at his or her expense. Whenever the responsible person or property owner fails to comply with a notice from any department of the City to remove same, the City shall have the power to direct that said accumulation be removed by the Department of Public Works at the person's or property owner's expense. A. Whenever garbage, trash, debris or other accumulation is left on the sidewalk or a curb area in a manner or amount that the Commissioner of Public Works deems to be a health or safety hazard, the Commissioner shall order that such accumulation be immediately removed by the Department of Public Works. Prior to removal, the Department of Public Works shall document such condition by means of photography. B. If deemed possible by the Commissioner, the Department of Public Works shall make a reasonable attempt to telephone the property owner prior to removal of the accumulation by the City. Such attempt shall in no way result in delay in the removal of the hazard. C. After removal of the accumulation, a bill for expenses incurred shall be presented to the owner of the property, personally or by mailing it to the owner's last-known address. If the owner fails to pay within 10 days, the Commissioner of Public Works shall certify to the City Treasurer the expenses incurred; and the amount of the expenses shall become a lien. The lien upon the property shall be included in the next tax bill rendered to the owner, unless paid before, and shall be collected in the same manner as other taxes against the property. The bill presented to the owner shall include all City expenses, material and contractor costs. D. A property owner may, within 10 days of receipt of the bill for expenses, appeal to the Commissioner of Public Works by letter, explaining the reasons why the bill should be excused. The Commissioner may then, solely within his or her own discretion, rescind the billing if he or she deems such action to be appropriate. E. In addition to such billing, the City is authorized to issue an appearance ticket, returnable in City Court, for violation of any provisions of this article. Penalties shall be as set forth in § 350-20 of this chapter. No person shall interfere with or remove or scavenge for material in any container which has been placed at the curb or in any bulk refuse which has been placed at the curb by the owner or occupant for collection by the Department of Public Works, unless duly authorized to do so. § 350-14. Promulgation of additional rules, regulations. The Commissioner of Public Works shall have the power and authority to formulate and promulgate from time to time such additional rules and regulations and directions, not inconsistent with the provisions of this article, as he or she may deem necessary for the proper conduct of the work of the collection of garbage and other solid waste in the City. For the purposes of this article, the terms used herein shall have the meanings ascribed to them in Article I, § 350-1, of this chapter. A. It shall be unlawful for any person to throw, discard, place or deposit litter in any manner or amount on any public property within the corporate limits of the City, except in containers or areas lawfully provided therefor. B. It shall be unlawful for any person to sweep into or deposit in any gutter, street or other public place within the City the accumulation of litter from any building or lot, or from any public or private sidewalk or driveway. C. It shall be unlawful to throw or deposit litter in any fountain, pond, lake, stream, river or any other body of water in a park or elsewhere within the City or on the banks of any such body of water within the City. § 350-17. Litter thrown from or caused by vehicles. A. No person shall throw or deposit litter from any vehicle upon any street or other public place within the City, or upon private property. B. It shall be unlawful for any person, firm, corporation or organization to transport any loose cargo by truck or other motor vehicle within the limits of the City unless said cargo is secured and covered in such a manner as to prevent depositing of litter. C. Vehicles used to transport upon the street any garbage or other offensive liquid or substance shall have watertight boxes or vessels so as to prevent the contents from leaking. § 350-18. Litter on private property. A. It shall be unlawful to throw or deposit litter on any private property within the City, whether owned by such person or not, and whether occupied or vacant. B. The owner or person in control of private property or any portion thereof shall at all times maintain the premises, or that portion controlled by him or her, free of litter. This requirement applies not only to removal of loose litter, but to materials that already are, or become, trapped in such locations as fences and wall bases, borders, embankments and other lodging points. § 350-19. Litter on publicly patronized or used establishments; maintenance of containers. To facilitate proper disposal of litter by pedestrians and motorists, publicly patronized or used establishments and institutions such as, but not limited to, fast-food outlets, shopping centers, convenience stores, supermarkets, commercial parking lots, motels and schools shall provide, regularly empty and maintain in good condition adequate containers that meet the standards as prescribed by the Commissioner of Public Works. Violation of any of the provisions of Articles I and II of this chapter shall be punishable by a fine of not less than $150 and/or 20 hours of community service, but not exceeding $700 and/or 20 hours of community service. The penalties for a second offense within a two-year period shall be a minimum fine of $700 and/or 40 hours of community service, but not exceeding $1,000 and/or 40 hours of community service, imprisonment not exceeding 15 days, or by both such fine, community service or imprisonment. The penalties for a third offense within a three-year period shall be a minimum fine of $1,000, but not exceeding $1,500 and/or imprisonment not exceeding 15 days. Each day’s violation shall constitute a separate offense. § 350-21. Fee system implemented. A bag user fee charge system is hereby adopted to be implemented for the collection of nonrecyclable garbage commencing on or about April 1, 1991. § 350-22. Program and fee structure. Said system shall be consistent with the program and fee structure as set forth in Exhibit I, included at the end of this chapter. This article shall take effect April 1, 1991. A bulky item will only be removed by the Department of Public Works if a sticker is placed on a conspicuous place directly on the bulky item and placed on the curb in accordance with Sections 7 and 8 of this Chapter. Bulky items with an official “Bulky Item” sticker will be removed on the property owner’s normal scheduled pick-up day. A bulky item that does not have a sticker will not be removed. Stickers may be purchased by property owners at commercial outlets or through the City for a $3.00 fee, or a fee amount as amended by City Council from time to time (See Exhibit J). § 350-26. Penalty for offenses. Any person who fails to place an official City sticker in accordance with the terms of this article shall be subject to penalties as set forth in Chapter 1, General Provisions, § 1-4, General Penalty. Each person shall provide for the separation of recyclables from other solid waste in the recyclables container provided by the City of Binghamton. The Commissioner of Public Works shall determine by regulation what constitutes recyclables and the particular requirements for separation, which regulations may be modified from time to time, provided that reasonable notice is given to the general public. Recyclables may not be deposited in the City garbage bag for public collection or otherwise except in accordance with this article, other applicable law or with written permission of the Commissioner setting forth the specific means by which recyclables may be handled. § 350-25. Prohibited removal of recyclable materials. The provisions of § 350-13 (Scavenging prohibited) of this chapter shall additionally apply to all recyclables. § 350-26. Public collection of recyclables. Only those persons using the public collection system for solid waste may use public collection for recyclables. It shall be unlawful for any person to deposit for public collection any recyclable not produced at the address from which collection is made or to bring recyclables into the City or from one address to another within the City for the purpose of taking advantage of the public collection service. Except where otherwise specifically authorized in writing by the Commissioner of Public Works, no person shall place any recyclables at curbside for public collection in any receptacle other than the County of Broome recycling container except for (a) clean newspapers, magazines, catalogs, paperback books, periodicals and/or telephone directories that are bundled or placed in brown paper bags and/or (b) clean single-ply cardboard and corrugated cardboard which is flattened and bundled or securely placed in brown paper bags or cardboard boxes when in excess of five pieces. No person shall deposit or permit the deposit of any material other than recyclables in the recycling container. Prior to placing recyclables in the recycling container, metal, glass, wax-coated beverage cartons, and plastic containers shall be rinsed so that they contain no liquid, gelatinous, or solid residue. Shredded paper will be placed in a closed paper bag. Other preparation of recyclables shall be as designated by the Commissioner of Public Works by regulation. Clear, green, and brown glass containers only may be put in the recycling container—labels do not need to be removed. Lids for such containers shall be disposed of as regular refuse. No broken glass, window glass, windshields, drinking glasses, colored glass (other than that specified above), ceramics, china or light bulbs may be placed in the recycling container but must be placed in with regular refuse to be disposed of pursuant to other provisions of this chapter. Clean newspapers, magazines, catalogs, paperback books, periodicals and/or telephone directories shall be securely tied with string or twine or placed in brown bags and placed in, atop or next to the recycling container. Additionally, brown paper bags, singly-ply and corrugated cardboard, and designated metals and plastics shall be recycled. (However, pizza boxes or other cardboard food containers to which cheese, sauce, or food residue is attached may NOT be recycled.) No books other than paperbacks may be placed in the recycling container unless the covers and bindings have been removed and disposed of as regular refuse. As other materials become designated recyclables, they shall be added by regulation of the Commissioner. Recyclables set out for public collection shall be set at curbside at such times, dates and pickup points as determined by the Commissioner of Public Works. However, recyclables shall be set at curbside no earlier than 6:00 p.m. on the evening before scheduled pickup. Containers must be removed from curbside by 11:00 p.m. of the day of collection. § 350-30. Enforcement; penalties for offenses. A. Enforcement mechanisms and penalties for recyclables shall be as designated in § 350-12 of this chapter. Additionally, designated City enforcement officers and/or the Commissioner of Public Works or his or her designee may issue an appearance ticket, returnable in City Court, for any violation of this article. Such lack of compliance shall be deemed a violation and shall be punishable by a fine of up to $1,000 and/or 15 days in jail. B. The Commissioner of Public Works may make such rules and regulations as are not inconsistent with the provisions of this article as may be necessary or desirable to aid in the administration of and obtaining the compliance with the provisions of this article. Effective April 1, 1991, the City of Binghamton will enter into a program of a user-fee charge for garbage pickup. 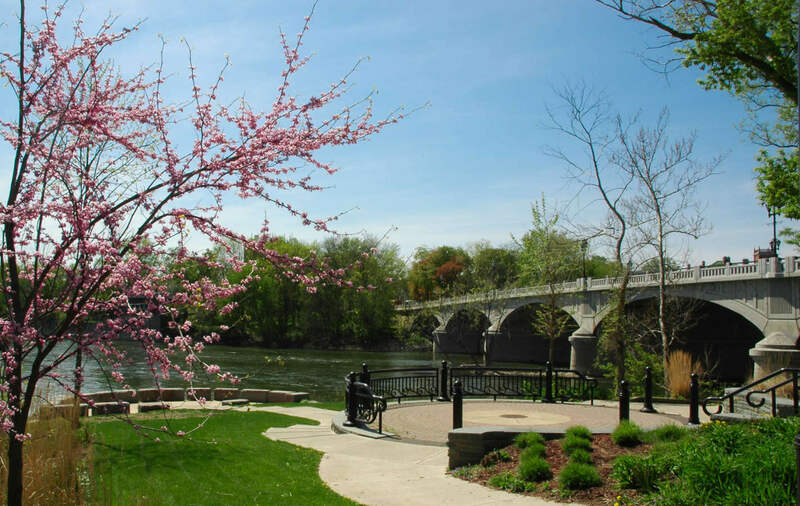 In order for garbage to be picked up within the City, such material must be placed within officially designated bags authorized by the City of Binghamton. The bags that must be used for placement of garbage in the City will be put out to bid on a regular basis. The bags will be distributed through either commercial outlets or through the City. The program and distribution of bags shall be coordinated between the Department of Public Works and the City Comptroller's office. The cost of the bags shall be reviewed on an annual basis and modified according to increased/decreased collection and disposal cost. The cost of the bags shall be in an amount as set from time to time. Only garbage is to be placed into the bags; recyclable materials must be recycled through the City's recycling program. Yard waste and trash is not to be placed in these bags for pickup. Yard waste, trash and recyclables will be picked up within the City on a regular basis at no direct charge to the consumer. The Department of Public Works, in conjunction with the Comptroller's office, shall be responsible for setting up programs for the obtaining of bags, the distribution and sale of bags, collection of funds, and rules and regulations as apply to garbage pickup and disposal. At the end of each calendar year, the Comptroller and the Commissioner of Public Works shall provide a report to the Mayor and City Council regarding the effectiveness of the user-fee bag system and related information.